"Of the number of our Hotel guests we have referred to theWeddingGuy, every couple has returned to us with very positive feedback as to the service they had received. We have furnished referrals to Peter and the team for services wherein our guests require either a Celebrant, or seeking a reputable Wedding Planning Contultant. I am sure that once you have been a client of theWeddingGuy, you will be satisfied with the level of professionalism and personal service by this company. As their company logo suggests they are truly, 'Professional, Personal,.. Exceptional.'" Zac Lumsden,General Manager,Princes Gate Hotel,Rotorua. On behalf of our team at theWeddingGuy Co - a HUGE Welcome! Your wedding day is one of the most important days of your life, and as such, planning towards your magical day should be a special and exciting time! If you're planning an intimate, large, simple, or extravagant wedding, we hope our advice goes some way toward assisting you in planning toward your BIG DAY. For all its excitement, planning and preparations for a wedding (whether it's your own, or you've been recruited by a friend), can sometimes be very time consuming and stressful. That's where our qualified and experienced team of wedding specialists fit in! Every member within our team at theWeddingGuy have been purposely "hand-picked" to dispel the need for you to have to hunt down the best - we believe we've done all the ground work in that department - allowing you the opportunity to simply enjoy the benefits of their expertise! We can work alongside you toward ensuring your whole wedding planning process is easy, stress-free, and most of all fun! Whether it's traditional or alternative, indoors or outdoors, religious or non-religious, an intimate wedding ceremony for two, or a special celebration with friends and family, we will take care of every detail, creating the wedding of your dreams and leaving you totally relaxed to enjoy every magical moment. Our team of Celebrants, Photographers, Graphic Artists, Couture gown designers, Cake artists, Hair and Make-up artists, and luxury accomodation providers are just some of our team who are not only passionate about what they do, but also committed toward, "...ensuring your Wedding Day is truly memorable... for all the right reasons!" Our first and most important piece of advice to any prospective Bride, or Groom, is, "start as you intend to finish!" Your success is all in the planning! - so start early to avoid the disappointment of running out of time. it can actually be a lot of "fun" if you approach it as one great adventure! 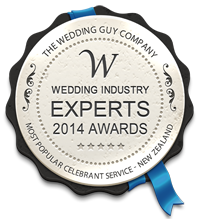 theWeddingGuy Co (New Zealand) Ltd.